Five state-owned companies would cooperate to build a monorail in the Jakarta region to ease traffic congestion in the capital city, State Enterprises Minister Dahlan Iskan said here on Thursday. "state-owned companies"........hehehehehe.......big money for the pejabat (high officials). Grab it.......open for big, big, big corruption. Consortium PT Jakarta Monorail (JM) has appointed China-based rolling stock manufacturer Changchun Railway Vehicle Co., Ltd. (CNR) to supply trains for the capital�s monorail project, which is planned to resume this year. �[The company] has appointed CNR. We held a selection process and [CNR] has met our requirements,� JM technical director Bovanantoo told reporters on Tuesday, adding that CNR had been operating for more than 10 years in the industry. Bova cited similarities between Indonesia and China as a factor behind the decision. He declined to elaborate on the details of the cooperation agreement between the two firms, or on the price of the trains. The company plans to display a mock-up of the train during Jakarta�s 486th anniversary in June as part of the company�s effort to introduce the future public transportation system to Jakarta residents. He also said that PT JM planned to operate 10 trains comprising nearly 200 carriages on two monorail lines by 2016. According to its website, CNR designs and develops more than 30 types of railway vehicles and urban mass transit vehicles every year, has more than 10,000 employees and has a factory area of 3.10 million square meters. Governor Joko �Jokowi� Widodo acknowledged that the construction of the monorail could not be restarted this month due to bureaucratic requirements that needed to be fulfilled. �We just have to complete administrative steps. We can�t ignore the steps and violate regulations. But I�m sure we can start it as soon as possible,� he said, adding that he had been waiting for the construction to resume. �We are working on it every day,� the governor emphasized. After being stalled for years, the much-awaited monorail project is set to resume as two former partners in the project consortium, PT JM and state-owned construction firm PT Adhi Karya, have settled the debt dispute between them and the latter has sold its entire shareholding to JM. Adhi Karya, the project�s subcontractor, built rows of support pillars along roads in Senayan, Central Jakarta, and Kuningan, South Jakarta, between 2004 and 2007 when it held a 7.5 percent share-holding in JM. However, JM failed to pay Adhi Karya for the work. The pillars were part of the planned first phase of a 14.3-kilometer route connecting Kuning-an and Semanggi in Central Jakarta. JM has recently agreed to pay Rp 190 billion (US$19.5 million) to acquire the support pillars. The figure, which is in accordance with current values, is slightly less than the Rp 193 billion initially demanded by Adhi Karya. Apart from holding the 7.5 percent shareholding in JM when the consortium was established, Adhi Karya also controlled more JM shares through PT Indonesia Transit Central (ITC), which was 20 percent owned by Adhi Karya. ITC, one of the consortium�s founders, owned 91 percent of JM shares at that time. The consortium is now 10 percent controlled by ITC and 90 percent controlled by the Singapore-based Ortus Group, which JM decided to engage earlier this year in exchange for $300 million in capital from Ortus. JM had previously said it aimed to restart work on the construction in April. 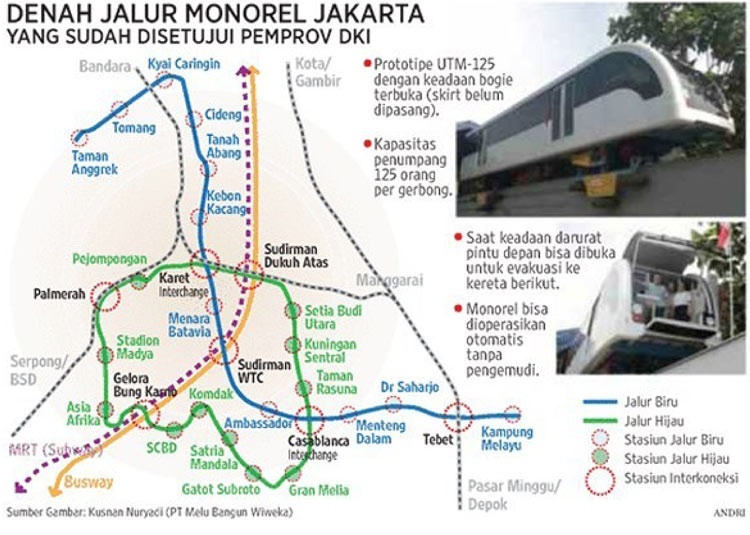 The consortium is proposing to build two lines: the green line, with 16 stations, will extend 14.27 kilometers from Komdak (the city police headquarters) to Satria Mandala Museum, both in South Jakarta; and the blue line will stretch 9.72 km from Kampung Melayu in East Jakarta to Roxy in West Jakarta, with 11 stations. 14.27 kilometers from Komdak to Satria Mandala? Both are roughly along the same street! So I suppose the route is a different one, because this would make no sense. Making no sense is nothing special here though. Yeah, but it will be a loop, so there they get the amount of km's. That blue line would be very interesting btw. An artistic impression of the vehicle. View of the expensives per transportation. The amount of passengers per transportation. The average speed during rush-hour. The average speed outside rush-hour. There is enough time left to go and see it at Monas. Impression of how the card will look like. Unfortunately for many tourists will the system be in only 1 language, although they are doing their best to attract more tourist to their city.